Horseshoe crabs have persisted for more than 200 million years, and fossil forms date to 450 million years ago. The American horseshoe crab (Limulus polyphemus), one of four extant horseshoe crab species, is found along the Atlantic coastline of North America ranging from Alabama to Maine, USA with another distinct population on the coasts of Campeche, Yucatán and Quintana Roo in the Yucatán Peninsula, México. Although the American horseshoe crab tolerates broad environmental conditions, exploitation and habitat loss threaten the species. 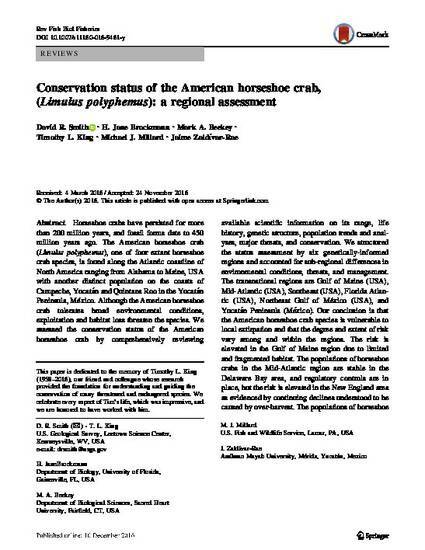 We assessed the conservation status of the American horseshoe crab by comprehensively reviewing available scientific information on its range, life history, genetic structure, population trends and analyses, major threats, and conservation. We structured the status assessment by six genetically-informed regions and accounted for sub-regional differences in environmental conditions, threats, and management. The transnational regions are Gulf of Maine (USA), Mid-Atlantic (USA), Southeast (USA), Florida Atlantic (USA), Northeast Gulf of México (USA), and Yucatán Peninsula (México). Our conclusion is that the American horseshoe crab species is vulnerable to local extirpation and that the degree and extent of risk vary among and within the regions. The risk is elevated in the Gulf of Maine region due to limited and fragmented habitat. The populations of horseshoe crabs in the Mid-Atlantic region are stable in the Delaware Bay area, and regulatory controls are in place, but the risk is elevated in the New England area as evidenced by continuing declines understood to be caused by over-harvest. The populations of horseshoe crabs in the Southeast region are stable or increasing. The populations of horseshoe crabs in the Florida Atlantic region show mixed trends among areas, and continuing population reductions at the embayment level have poorly understood causes. Within the Northeast Gulf of Mexico, causes of population trends are poorly understood and currently there is no active management of horseshoe crabs. Horseshoe crabs within México have conservation protection based on limited and fragmented habitat and geographic isolation from other regions, but elevated risk applies to the horseshoe crabs in the Yucatán Peninsula region until sufficient data can confirm population stability. Future species status throughout its range will depend on the effectiveness of conservation to mitigate habitat loss and manage for sustainable harvest among and within regions.